Dysfunctional families – where would indie movie makers be without them? A staple of indie movie making, the dysfunctional family has provided us with some great movies over the years, from The Royal Tenenbaums (2001) to Little Miss Sunshine (2006) to August: Osage County (2013). Now it’s John Krasinski’s turn to shine a light on a family for whom “normal behaviour” isn’t exactly customary practice. Krasinski plays John Hollar, a struggling graphic artist whose self-confidence is almost exhausted. As if that wasn’t enough, his girlfriend, Rebecca (Kendrick), is expecting their baby. Feeling the pressure from both sides, things get even more stressful for him when he learns that his mother, Sally (Martindale), is in the hospital and needs an operation to remove a brain tumour. Returning to his hometown after several years away, John reconnects with his father, Don (Jenkins), and his older brother, Ron (Copley). With a few days to go before the operation, John comes face to face with the problems and issues that occupy his family members’ time. Ron is screwing up his divorce from Stacey (Dyke) by spying on her and her new partner, Reverend Dan (Groban), as well as acting inappropriately in order to spend time with his two daughters. Meanwhile, Don’s plumbing business is on the brink of going under. Adding to John’s worries is one of his mother’s nurses, an old high school classmate called Jason (Day) who has married John’s old girlfriend Gwen (Winstead). At first, Jason is concerned that John is going to try and sleep with Gwen while he’s back. John reassures him that he won’t, and receives an invitation to dinner. But though his intentions are honourable, Gwen’s aren’t and he has to rebuff her advances. Wanting to be open and honest about the encounter, he tells Rebecca about it, but in such a clumsy way that she becomes worried and travels to his hometown to be with him. Once there, she reveals a few truths that John has been avoiding admitting, while he too reveals a truth that she has been unaware of. Meanwhile, Ron finds an unlikely supporter in Reverend Dan, Don takes a job at a wine store to bolster his business’s finances, and soon, the day of Sally’s operation is at hand. Krasinski has said that the one-liner for The Hollars is something that we’ve heard before: a guy goes home to his family and finds out about himself. And he’s spot on. But while it’s true that it’s a theme that’s been done several times before, and that the movie doesn’t really offer us anything new in terms of characterisation or the narrative, what the movie does do is to introduce us to a new, disparate bunch of people who are all trying to deal with their own individual problems, while also trying to support each other as best they can. But that’s the basis of any movie about a dysfunctional family. The question to ask is: within its own terms and its own ambitions, does The Hollars work? Inevitably, the answer is yes and no. There is much to recommend The Hollars, and Krasinski plays to the strengths of Jim Strouse’s screenplay at every opportunity. The characters are well-drawn, and the interaction between them is sympathetic and knowing, allowing the cast to display each character’s vulnerabilities and strengths to good effect. From Krasinski’s self-doubting, slightly adrift John to Copley’s manic, short-sighted Ron, from Jenkins’ overly emotional, self-deluding Don to Martindale’s anxious yet eternally supportive Sally, and Kendrick’s mostly confident, comforting Rebecca, the movie is populated by characters who are easily recognisable and a pleasure to spend time with. Strouse keeps the various inter-relationships on the simple side, with few complications to upset or muddy the waters. This allows the viewer to engage with them more easily, and though this also leads to a feeling of unnecessary mawkishness that develops as the movie goes on, Krasinski’s skill as a director ensures it doesn’t overwhelm the material as a whole. Krasinski is helped by a clutch of great performances, and he exploits each member of his talented cast in justifiable fashion. Jenkins does bewildered to very good effect, making Don seem as if he’s barely in the room. Copley’s take on Ron is to mix a committed father with an ADD sufferer, and he provides a good deal of the movie’s easy humour. Kendrick tenders another slight variation on the type of character that she always plays in this kind of thing, but Rebecca is very much a supporting role whose job it is to show John the way forward when he needs it. Krasinski slips easily into the central role, and plays the gauche, somewhat perplexed John with a good deal of charm. But if anyone stands out from the ensemble cast then it’s Martindale, who once again, reaffirms her status as one of the best character actors currently working in movies. As the affable, good-natured Sally, Martindale gives a delicate, thoughtful performance that is entirely natural and heartfelt. But while the performances are the movie’s main draw, some of the subplots fail to take hold in – perhaps – the way they were meant to. Ron’s often childish behaviour, particularly in the presence of Reverend Dan, is a little over-the-top and far from credible, even for a character who appears, for the most part, to be a man-child. And Don’s business problems, which at first seem like they’re going to have a lasting impact on the family as a whole, waste a whole scene where he’s refused credit, only for a solution to come along that fails to address the issue of depleted funds entirely. The inclusion of John’s ex-girlfriend, Gwen, has even less impact, as beyond the dinner scenes, she doesn’t reappear, leaving the viewer to wonder if she was meant to have an effect on John’s life in some way. But if that’s so, then it seems it was either left out at one of the draft stages, or on the cutting room floor. These failings help to make the movie feel uneven at times, and there’s a definite sense that more time would have been needed to address them properly. Overall, Strouse’s screenplay and Krasinski’s direction combine to make The Hollars an enjoyable comedy with serious moments, and a poignant drama with humorous stretches. A lot of it is predictable, but that’s not a bad thing as this is one of those occasions where familiarity breeds fondness and uncomplicated indulgence instead of contempt. 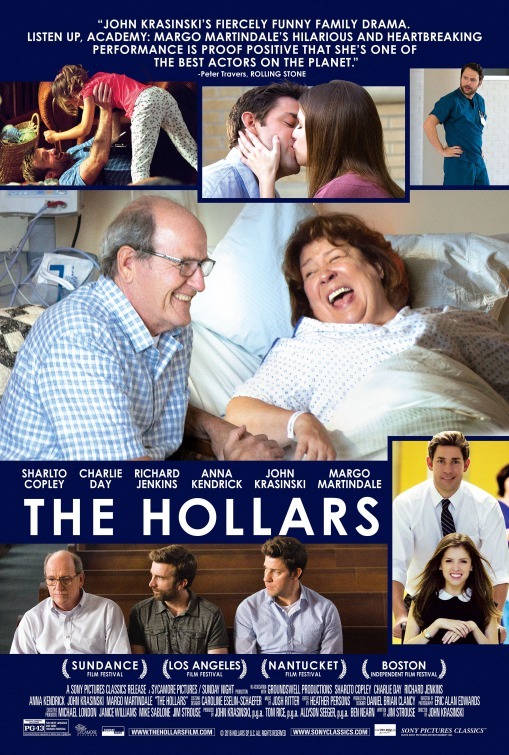 With a suitably indie soundtrack made up of original songs by Josh Ritter, and a winning, relaxed feel to proceedings, The Hollars provides viewers with an offbeat, captivating experience that adds up to a warm-hearted, generous good time for anyone that seeks it out. Rating: 7/10 – genial and obliging, The Hollars doesn’t waste a second in its attempts to get you to like it, and once you do, you can forgive it when the material stumbles over itself from time to time; buoyed by a great ensemble cast, and a good sense of its own strengths and weaknesses, it tells its story succinctly and without any undue fuss – and that’s not always when there’s a dysfunctional family involved.